In addition to a rigorous core of courses that convey fundamental lessons in management, economics, statistical analysis and law, as an MPA student, you'll also pursue a concentration—an area of specialization—that appeals to your specific interests. Your specialization options are numerous and varied. It is in one of our 12 concentrations that you'll be able to grow your passion into professional expertise. You can also work with one of our advisors to create a specialized concentration or you might focus on research by pursuing our thesis option. 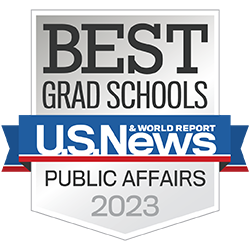 SPEA offers top-ranked curriculum areas and the #1 MPA Program in the nation. Answer the questions of how to develop and manage resources to improve our quality of life—all in a responsible, sustainable, cost-effective way. Put yourself in a position to meet the crucial energy issues and challenges that dominate the global landscape. Combine environmental knowledge with policy know-how to affect crucial issues. Have a voice in this defining debate with vital knowledge of the many ways government actions affect health and healthcare. Focus on the innovative use of information technology to address complex societal and environmental challenges. Gain a policy-focused understanding of the challenges and opportunities facing advancement in developing countries. Become an effective leader ready to address the challenges in our urban areas, and ready to improve the quality of life for communities. Serve the public good, prepared for a leadership position in the nonprofit sector, government agencies that deal with nonprofits, or in the philanthropy field. Improve decision making through a range of analytical techniques—all designed to change, and improve, lives. Apply the theory and practice of raising revenue and allocating resources, and graduate ready for a variety of powerful positions. Learn the political, legal, and societal contexts in which public policies are adopted and implemented, prepared to lead at the managerial and executive level. Achieve sustainable strategies to ensure natural and social environments endure for future generations. Work with us to define a degree tailored to your own ideals and crossing the spectrum of knowledge we can provide.